Drink one half of your body weight in ounces each day. That means if you weigh 120 pounds, you should be drinking, on average, 60 ounces of water per day. The usual follow up question is “why?”. Your intervertebral discs are mostly made up of water and its job is to act as shock absorbers for the vertebrae. Without proper hydration, disc degeneration can occur and may cause various back problems. 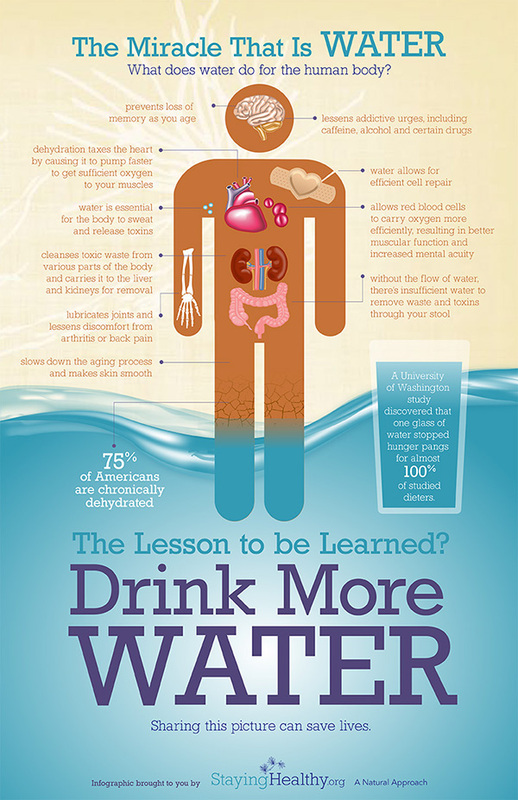 In addition, see the infographic below for other health benefits of drinking the proper amount of water each day. Want to learn more about your body and how to get and stay healthy? Then book a new patient visit for you and your family today! Chiropractic adjustments release stress from your body and improve your nervous system by regulating the “Fight or Flight” response, improving your sleep and boosting your immune system 200%. This a simple and effective way to help prevent diseases, such as colds & flu. Wash your hands with running water and soap; rub your hands together for at least 20 seconds(kids can recite the alphabet or sing “Happy Birthday”); and pay special attention to your wrists, the backs of your hands, between your fingers, and under your fingernails. Several vitamins and minerals are known to boost the immune system, like Vitamin A( please check with your PCP if you are pregnant or nursing regarding Vitamin A), Vitamin C and Zinc to name just a few . It’s best to get most of your vitamins and minerals from whole food sources and supplement as needed. Adding fiber such as whole grains to your diet to improve colon health and increase immunity. Drinking eight glasses of water daily can decrease the risk of colon cancer by 45%, bladder cancer by 50% and it can potentially even reduce the risk of breast cancer. Eating more yogurt or supplementing with a high quality, combination probiotic can boost the healthy bacteria in your gut where about 70% of your immune system resides. Exercise has the ability to protect and strengthen the immune system. Studies have shown that a regular exercise program of simply walking briskly for 20-30 minutes, 5 days a week can enhance the immune system’s antibody and natural T -cell responses. If your stress response is constantly activated it can lead to life-threatening health conditions and leave you more susceptible to colds and flu due to the continuous release of stress hormones. Finding a healthy way to manage your stress, like meditation, yoga or tai chi is essential to the health and vitality of your immune system. Studies show that people who get about seven hours of sleep a night have the best survival, and if we get less than six hours of sleep a night, our mortality seems to increase.Sleep loss not only plays a role in whether we come down with a cold or flu, it also influences how we fight illnesses once we come down with them.